When I open a Voxler project file, the screen is black and I can’t see any of the graphics modules. Why? If you are opening Voxler project files (VOXB files) and see a black screen or an empty Viewer Window, the project has not been updated since opening. 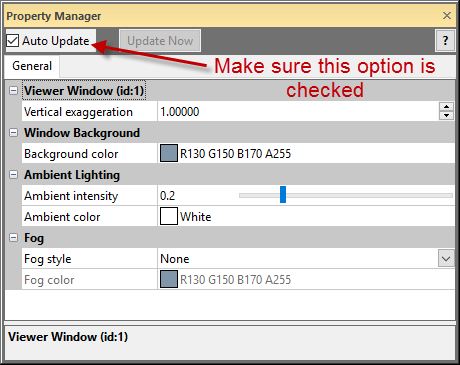 To resolve this, you can click the Update Now button at the top of the Property Manager or keep the Auto Update checkbox checked. How can I display a label for the sample values along the wells from a WellRender in Voxler? My manager has disappeared from Voxler's interface! How can I render or display a lithology log, which is in text values, along a well trace in Voxler?